You can plan your entire kitchen easily but when it comes to handling corners, the choice is difficult to make. Depending on how frequently and easily you want to access a corner; you may want to either insert a cabinet for stocking rarely accessed stuff or you could choose to convert it to a corner kitchen sink. Again, your decision of installing a corner kitchen sink or not would depend on whether you have sufficient space or not. Large kitchens have the luxury of accommodating a corner kitchen cabinet easily but the same can also be considered for a small or medium L shaped kitchen. Instead of having the sink at the end of either of the L legs, you could plan it in the corner of the L shape. Corner kitchen sinks have quite a few advantages. Firstly they occupy the dreaded corner point and thereby make it rarely accessed location. You could easily stack cleaning stuff in this cabinet under the sink and forget worrying about accessing it time and again through the day. Corner kitchen sinks give you a great flexibility and flow while working on your kitchen platforms. For instance, if your kitchen is U shape or L shape and you have a corner kitchen sink; it would be easier to move around in between your cleaning of veggies, fruits or dishes to cooking (from the corner kitchen sink to either of the platforms on the sides). Corner kitchen sink designs available in the market vary from simple to stylish, affordable to expensive and in various colors. They are available in various materials like stainless steel, natural stone, granite, cast iron, clay, acrylic, enameled steel etc. 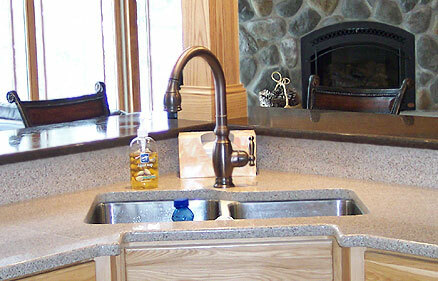 Single and double bowl corner kitchen sinks are readily available. In all these materials, you can get a host of colors to choose from. However, corner kitchen sink design alone is not enough while making a decision; you need to see its functionality and durability over a period of time. Hence go for material and capacity that suits your daily cleaning requirements and can endure the everyday wear and tear from washing of dishes. Sink depth is another feature that must be considered well before purchase. Depth should be considered as per ease of the user (one who has to do cleaning work for long hours), cleaning load and ease of maintenance of the sink. Undermount corner kitchen sinks are available in different shapes and sizes. Ones with round corners are best suited to any kitchen as they are relatively easier to clean as opposed to those with straight corners (like a square or a rectangular sink). Again, they are available in single and double bowl capacities. Single bowl undermount corner kitchen sinks are suited to small kitchens while double bowl sinks suit a large kitchen or in case you have a regular heavier load. Installation of a corner kitchen sink is not as difficult as perceived by many. In fact, installing it is as easy as installing a sink at the end of one of your kitchen platforms. Undermount corner kitchen sinks should be carefully installed below the countertop, keeping in mind to firmly secure it with clips. Determining the exact dimensions of the countertop hole and the size of undermount corner kitchen sink is a pre-requisite that must be carried out before purchasing one, otherwise installation may be difficult. If you are not comfortable or confident of installing your corner kitchen sink yourself, you can always consider having the contractor install it for you. While planning a new kitchen you can decide on whether you want to go for a corner kitchen sink or one at the end of the L or U shapes. In this case, it is much easier to install as you still have not fixed the cabinets and water pipe links. However, deciding on a corner kitchen sink can be a little difficult for already established kitchens, wherein you may not only have to do extra cabinetry work, but also change the pipes to route the water flow towards the corner cabinet. In either case, you should plan well because it is not an easy task to change the kitchen layout in a year or two. Think about durability, functionality and above all ease of use and access. Click here for the best deals on corner kitchen sinks. I was never too fond of corner kitchen sinks, but the one in the picture looks pretty neat.